We study in this note the relationships between two usual models of learning via queries: the so-called exact and bounded learning models. One of our goals is to point out under which conditions the learning dimension functions, as the abstract identification dimension, originally defined assuming the bounded model can be also used in the exact setting and how the results obtained by using them have to be interpreted. Castro, J. 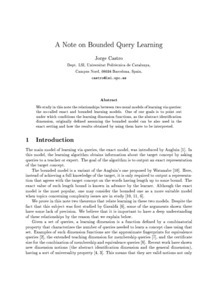 "A note on bounded query learning". 2005.